A benchtop MALDI-TOF mass spectrometer, suitable for analyzing many different types of samples, including synthetic polymers, biomolecules, organometallics, and small organics. Includes a 10 Hz N2 UV laser, reflectron ion optics for enhanced sensitivity, post-acceleration detector (PAD) for high MW species analysis, and dual polarity detector for analysis in both positive and negative ion modes. Fully integrated MassLynx acquisition control and processing software allows for easy data acquisition, storage, and reduction. 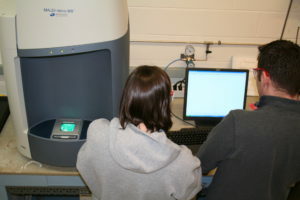 Sierra Analytics Polymerix processing software allows for the determination of important characteristics, such as number-average molecular weight (Mn), weight-average molecular weight (Mw), polydispersity index (PDI), and degree of polymerization (DP) for each homologous series in a homopolymer mixture.